In my spare time I've been reading the Internet, like woah, and one blog I've been reading for a while is The Mom Creative, which presented 31 Days of Memory Keeping in October. It was a great series, and I got a lot of good ideas. The Mom Creative is also great about sharing online deals related to memory keeping (cheap photo prints, free photo books, etc.) 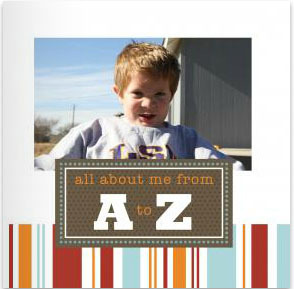 -- it's how I made the ABCs of Owen book over the summer for the cost of shipping at Paper Coterie. Good stuff. I don't know that I'll ever consider myself a successful memory keeper, but I've had a lot of fun making things for Owen. And our wedding book is one of my favorite things (although I certainly wish I'd spent more time lightening/adjusting the photos in that book). We have many a photo album at my mom's house and grandma's house that catalog my and my sister's childhood. And I think about the weekly letters my mom wrote to her mom and wonder what memories those held, and if they survived the years (I'm guessing not). I have my own journals to see about my life from my perspective once I could write (ca. 2nd grade). Today's NaBloPoMo blog prompt: If you knew that whatever you ate next would be your last meal, what would you want it to be? Sort of easy: Gran's fried chicken or chicken-fried steak, new potatoes and white gravy, loaded salad w/ Catalina dressing, Sonic vanilla diet coke, millionaire pie. Mmm, love fried chicken so I can't blame you there.